As I introduce my children to spiritual disciplines this year, what is it that I want to happen? What is the goal? I pondered these questions during December as I read Spirit of the Disciplines and pictured what our 2017 would look like. When I picture what I want for my children and their relationship with God, I picture a life of joyful discipline, the type of discipline that leads to transformation. That’s why, as I considered how to introduce prayer to them, I was careful not to make anything too rigorous. I want them to want to pray, to understand prayer as a gift, a lifeline, a source of strength and joy. My goal is to point their hearts toward God, not just to alter their habits. In his book, Desiring the Kingdom, James K.A. Smith argues that much of Protestant Christianity aims for the “head,” the intellect, in discipleship, while our surrounding consumerist culture aims for the heart. Culture wins, Smith posits, because we are not primarily intellectual beings, as much as we would like to think of ourselves as such. Rather, we are much more motivated by our emotions, our “gut,” than we acknowledge. Smith thus argues that Christian education needs to reorient toward the heart—specifically, by incorporating bodily practices into Christian education. His suggestions veer more toward high church liturgy, but I see definite overlap in his argument and Dallas Willard’s discussion of the bodily disciplines. We are physical creatures, the thinking goes, and so we need physical, bodily disciplines to capture our hearts. During the first week of January, I introduced the idea of set times of prayer for our family. This practice formed the backbone of our month of prayer, and it is something I hope to continue throughout the year. Now, the exact details of what I’m about to tell you about our times of prayer most likely won’t work for you. That’s okay. What I would urge you to think about as you read about ours is what would work for you. How can you fit regular prayer in your family’s schedule in a way that feels like an opportunity, a gift, and not a burden? For us, it worked to establish four times to pray each day, two of which we were already doing. Each morning during our “family time” in school, we say a prayer together after reading the Bible and watching CNN Student News. We use a laminated template I made to write down our various requests with dry erase marker, and we revisit it each day. I uploaded the template here, in case anyone else finds it helpful for their family. For us, since we were already in the habit of this morning prayer, it was not hard to continue it throughout the month. Then, I added a time of private prayer to the beginning of our Quiet Time, which we have after lunch. For this, I ordered each of the kids a copy of Jennifer Gerhardt’s Kids Prayer Journal. These journals are simple, but proved very useful for our purposes. In the journal, which focuses on the Lord’s Prayer, there is a page for each day, Monday-Saturday, for 13 weeks. 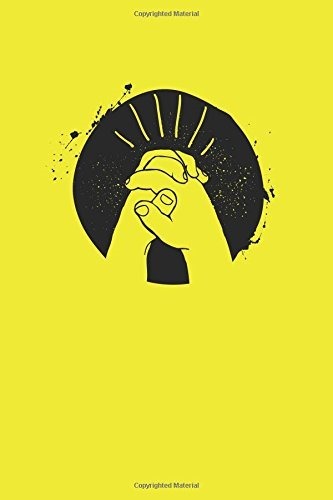 The prayer prompts on each page are simple enough not to be onerous for reluctant writers, but deep enough to really help kids start bringing their thoughts, hopes, and concerns before God. Both Luke and Anna had no problem completing a page each day, and better still, they really seemed to take it seriously. I highly recommend these journals, which you can order from Amazon. 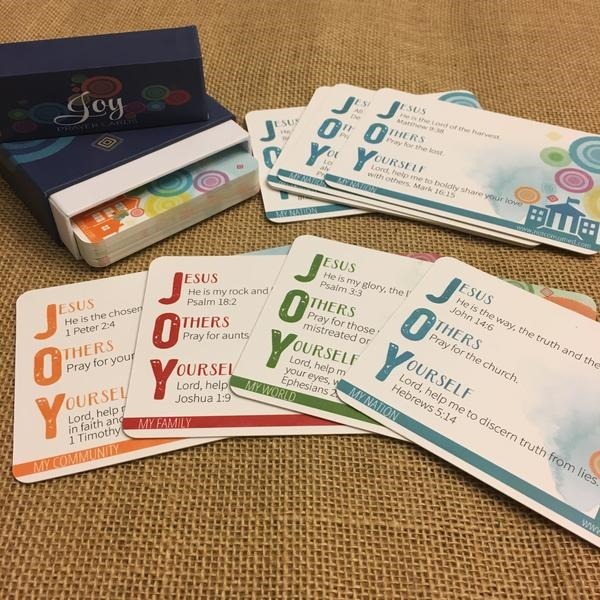 At dinner, we typically say a family prayer before each meal, but to add some variety and depth to our prayers, I ordered Kim Sorgius’ JOY Prayer cards. These cards each have three prompts to help focus on Prayers: Jesus (which lists a characteristic of God), Others (which suggests a person or group to pray for), and Yourself (which includes a pers onal request). We found that we needed to discuss each prompt a bit before we prayed, so our dinner prayers ended up being “Thank you for dinner” prayers rather than “Bless this meal” prayers. We would discuss each card over dinner, and then one of us would pray the prompts after we were done. This was a little more difficult for my kids to catch on to than I thought, and they seemed kind of intimidated by praying from the different prompts, but they warmed up to it. You can order these cards here (and if you are poking around on her website, I also highly recommend her hymn studies). Lastly, each night, one of us would pray with each child as they lay in bed. I’m sad to say, we had gotten way out of the habit of these nightly prayers. By bedtime, the kids and I have spent a full day together, and we usually do just a quick tuck-in and kiss. However, the kids love a longer bedtime routine, so they were genuinely excited for us to snuggle under the covers with them, discuss their day a bit, and then say a “chain prayer” together. This was probably their favorite addition to our day, and we all enjoyed the extra bonding time at night. In fact, that was the biggest lesson I learned this month. When I think of discipling my kids, I picture it in three main ways: modeling, giving them resources to practice the discipline on their own, and practicing the discipline alongside them. This month, I did all three: I continued to model my own morning prayer time; I gave the kids a prayer journal and some other suggestions to pray during the day; and Greg and I prayed with them. By FAR the technique with biggest impact was praying with them. Not only did prayer build our relationship and give us a chance to talk to God together, it also led to some great conversations. For instance, when Anna hesitated to pray for a woman she did not know well, who had lost her father, we had a great talk on praying with empathy. We discussed praying for people the way we would want someone to pray for us in that situation, to really picture what they are going through and how we would feel. It never would have occurred to me to bring those ideas up, but they came up naturally as we prayed together. Looking back on the month, then, my number #1 recommendation is simply to pray with your child. My #2 recommendation is to get them Gerhardt’s prayer journal. We colored and hung famous prayers around the house. I printed out four prayers for them to decorate the borders, and they threw themselves into the task. 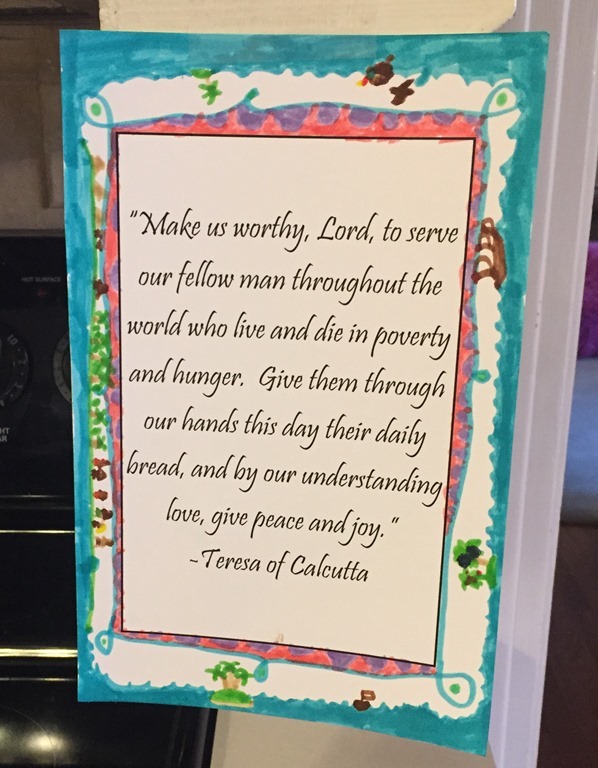 We love the Lord’s Prayer, of course, and I came across one from Mother Teresa in a biography we were reading. St. Francis’ prayer is one of my favorites, and I got to tell the kids how I first heard that prayer on September 11, 2001, when a professor read it to us at chapel. I sat in the balcony holding my brother’s hand, and the words of that prayer were the one thing that made sense in that senseless day. They gave me a path forward. Lastly, I printed on from Thomas Merton that I thought might be a little above them, conceptually, but that I knew would lead to a good discussion about uncertainty and pursuing God even when you don’t understand everything. You can print your own copies of the link here. We talked about praying simple prayers over and over, or ones that we pray automatically when we were in specific need. For instance, Anna resolved to pray, “Lord, make me an instrument of your peace,” every time she got frustrated with her brother. I’m not sure how well she followed through with this, but the seed was planted. We tried “throwing prayers” at people randomly. I got this idea from Richard Foster’s chapter on prayer in Celebration of Discipline. One can silently throw prayers to people at the store, for example, or the kids getting on and off the school bus as we were stopped and waiting for them. All in all, this was a good month of prayer for our family. It was a discipline, in that it took sustained effort, and we certainly weren’t perfect at it. Cultivating the habit, however, of praying as a family multiple times a day has been helpful to us and has led to many great conversations about God. My plan is to keep our set times of prayer as best we can throughout the year. And now, I’m looking forward to February’s discipline: meditation!